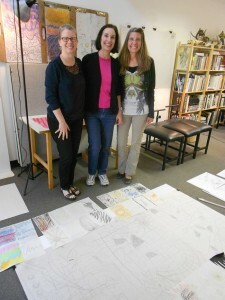 One Saturday morning, three women set out to conquer fear of drawing from the imagination. Like brave creative warriors with swords in hand, they embarked on a 4-hour adventure into uncharted territories of the mind. 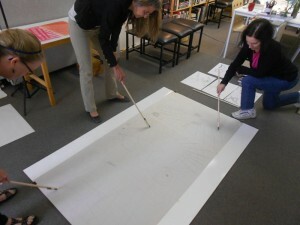 In fact, they were holding long wooden dowels with various drawing media attached, participating in one of several exercises in our first Experimental Drawing Workshop for adults. 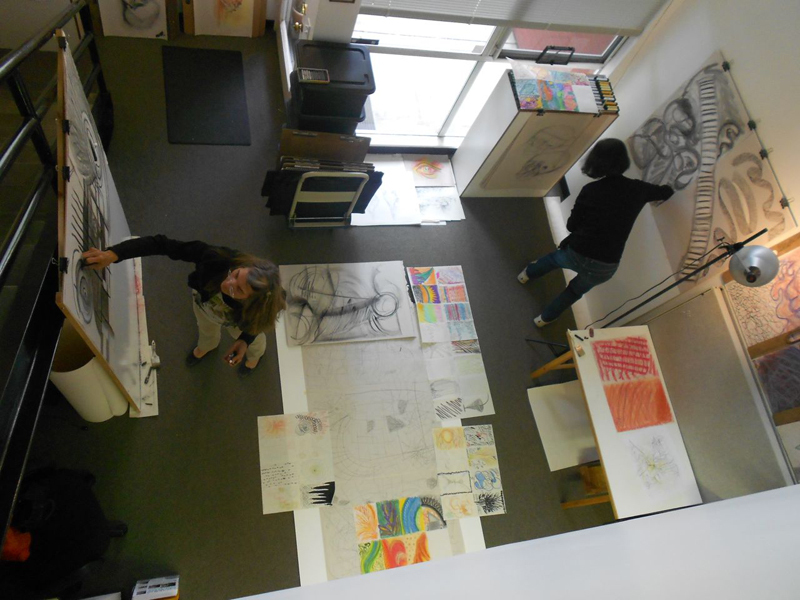 And judging by the work produced and the smiles on their faces, the journey was successful. 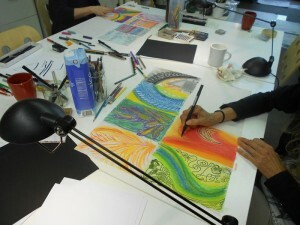 The workshop emphasizes drawing as a medium to investigate the power of creative thinking while opening new doors to self expression, problem solving, and conveying ideas. As with all of our Scribbles Institute courses, the value of the Experimental Drawing Workshop is what you come to learn about yourself through the process of drawing. 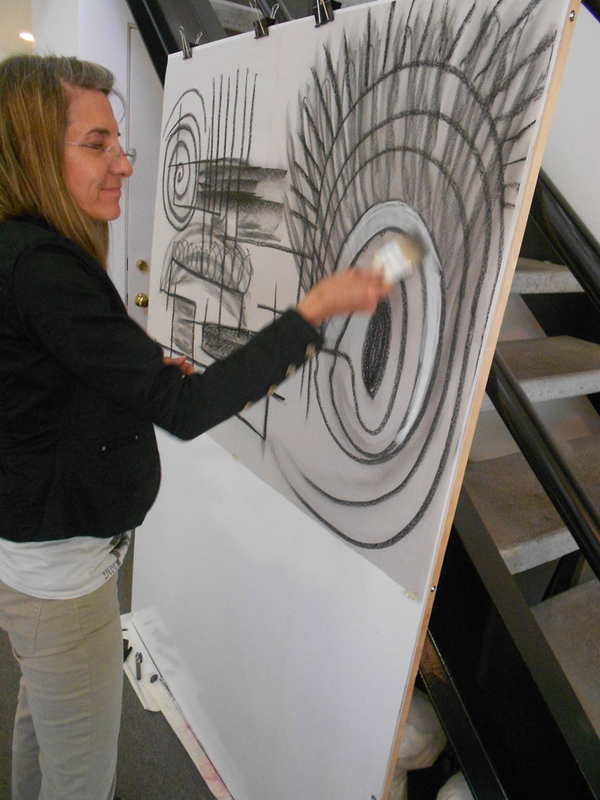 We moved away from our usual strategies of observational drawing and dove into the depths of creating spontaneous, non-representational compositions. As we sipped our chosen morning beverages, we began creating non-representational, abstract drawings. We depicted human emotions and traits by using only lines, shapes, patterns, tones, and color as we tapped into modes of unconscious thinking. After a lunch break we continued with a fun collaborative exercise using wooden dowels for drawing on large paper laid on the floor. 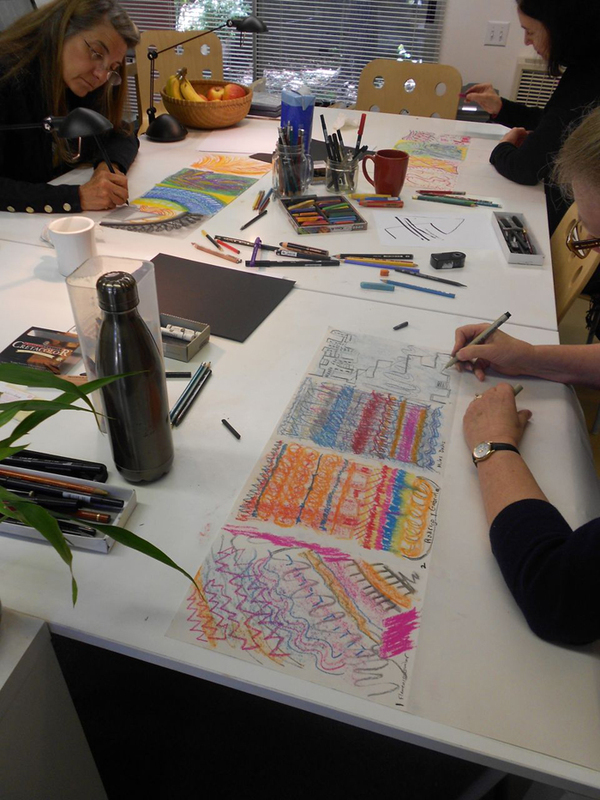 We then moved to another round of non-representational drawings, this time eight abstract compositions, each depicting a specific music genre we listened to. 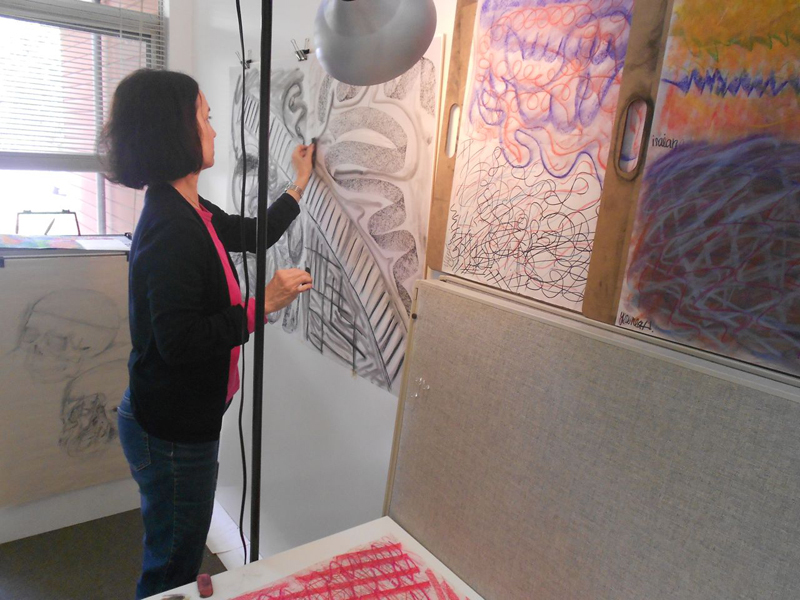 Now deeply wired to the abstract drawing mode, we moved to the big drawing boards, turned up the music and let loose with large-format mixed media compositions. 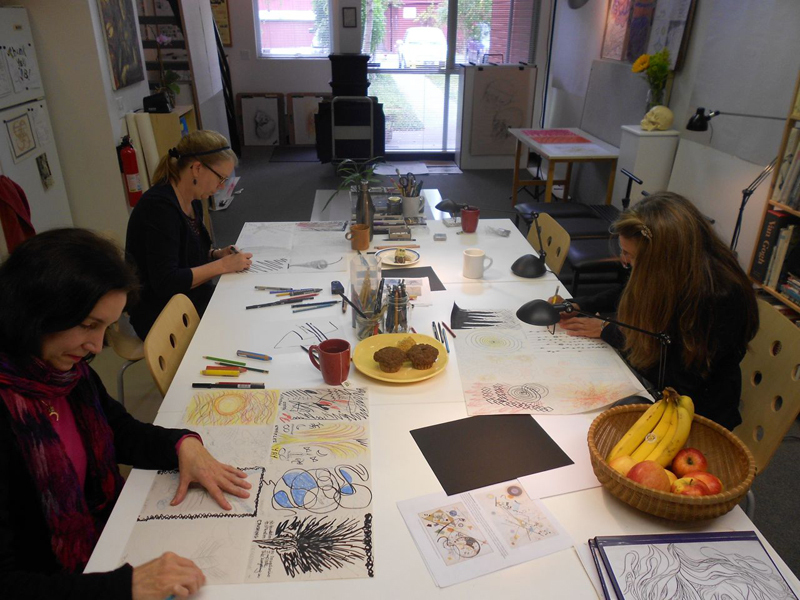 It was exciting to see Judith, Pamela, and Bev overcome the urge to express ideas with realistic, representational imagery and develop their own visual language through the rhythms of line work and tonal values. With a new found confidence in non-representational, abstract drawing, they are ready to set sail on future journeys to exciting, new worlds of the imagination.